This weekend I’ve got news on a unique experience for you Bijou brides planning a truly luxurious Wedding. Quintessentially Weddings has announced the return of its splendid showcase, the Quintessentially Wedding Atelier, running from the 6th – 8th of November 2015. Hosted for the first time at the iconic Claridge’s Hotel, the Atelier will transform the venue into an enchanted winter wonderland, curated by Quintessentially Weddings’ world famous wedding planners, complete with the finest luxury brands and artisans. The showcase will offer brides and grooms the chance to step inside the stunning wedding destination for exclusive access to Quintessentially Weddings’ little black book of couture contacts. Guests will receive elite expert advice with access to a hand picked selection of designers, florists, gastronomes and photographers, as well as experiencing a unique bridal catwalk show. Brands showcasing include lingerie designer La Perla, Chanel Beauty, Parisian sweet maker Laduree, Mr & Mrs Smith and John Nassari, with further names to be announced in September. Combining the finest craftsmanship with impeccable taste, the Atelier creates the ultimate wedding emporium for brides and grooms, in order to help them curate their very own fairy-tale wedding. 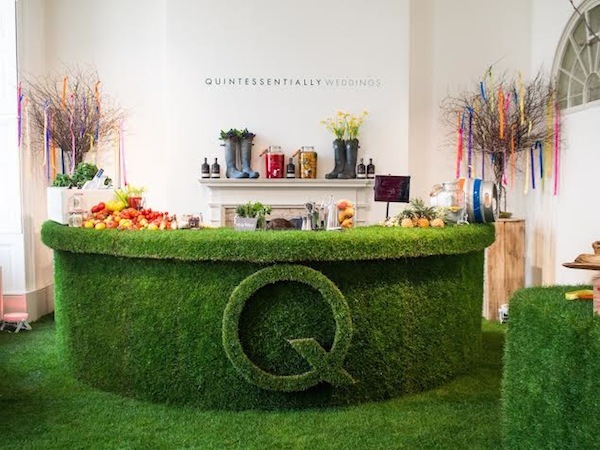 Tickets for the Quintessentially Wedding Atelier are available for £35 per person. To complete the magical day, Claridge’s is also offering a tasting of its delightful Afternoon Tea, available through appointment at an additional price of only £25 per person. Please visit the website for more information www.quintessentiallyweddings.com/atelier.